Last week I started a poll. Imagine that tomorrow the world decided there can only be a limited number of distributions. Which distributions would you save? The poll’s reception was mixed. At first the people at Reddit thought it was a dumb idea and the topic got voted down. It then picked up and 13 people commented on the concept. The people at Linux Today warmed to the idea and the votes came flooding in. In the end the article itself received 6090 pageviews and 44 comments. Bizarrely despite there being so many pageviews there were only 362 votes cast. The graph above tells you everything you need to know. Debian came out clearly on top followed by the usual suspects of Ubuntu, Mint, Arch, Fedora and openSUSE. The people who use Luninux, Snowlinux and Rosa were far too cool to vote on such a silly subject and decided to keep away from such a bizarre concept. But what about my distribution? A common theme in the comments was the question “What about Distribution X?”, “Where is Distribution Y”. 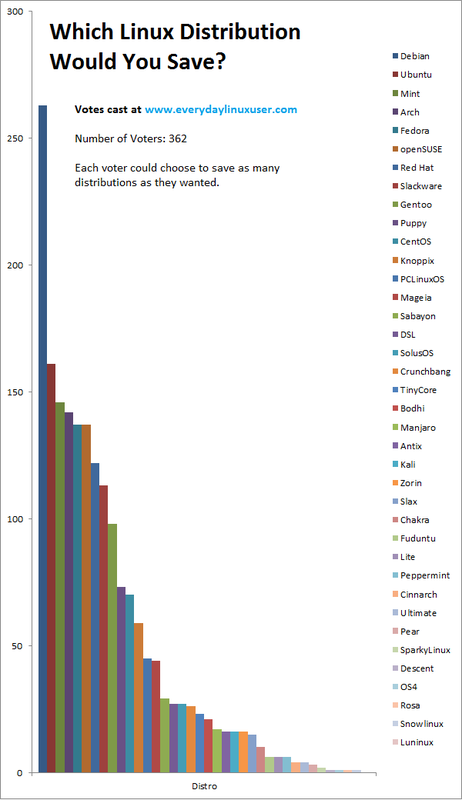 Well I could have listed all 300+ distributions on Distrowatch but the graph above would then look even sillier than it already does. Instead I am going to give an honourable mention to the distributions I left out in the poll right here, right now. What can we learn from the results of this poll? I would say not a lot. The first reason is the number of votes cast. The proportion of people voting is obviously a very small subset of the Linux community. It also has to be concluded that the bigger distributions received the highest number of votes. This was always going to be the case because they already have a larger user base and people tend to vote for the distributions they actually like as well as the ones that are actually most important. I think the comments actually provide far more information than the poll results themselves. The conversation that generated from the poll was very good. Who would vote against a particular distro, using another? And why should he or she do so? So you get a nice picture about how many users distros have but nothing more. Furthermore not all are just forks. Some have a specific purpose but for only a few people. It is a fair point. Why should people vote? Well to be honest I started the poll as a bit of fun and out of interest to see the response that I would get and how the votes would be cast. The whole idea of “better” is entirely subjective. Better for desktops? Better for servers? Better for commercial software support? Better because I said so and I’ve been using Linux longer than some of you have been alive? Every distro out there was created to “better” meet the needs of someone. In equal measures came comments from both sides of the argument that I initially laid out when starting the poll. Some people say though that it would be better if some of the smaller distro creators concentrated on contributing to their upstream project. You can argue for both camps in this debate. If there isn’t a distro doing what you do and it is worthwhile then there is merit to your work. On the flip side if more people worked on the upstream projects they may be even better than they already are. The text in blue was written by me at the top of the poll. I would rather have as many distros as possible than a limited amount. Some people complain about one and enjoy another, I love ’em ALL! Even the ones I don’t use have something to contribute! The idea of spins, to me, is great. I mean, that’s how Linux Mint got started, and what a distro that is! Fedora, for instance, doesn’t really care about making life easy for the home desktop user. Enter Korora. It blends some things from Ubuntu and uses the KDE and Gnome desktops to make a nice Fedora experience. I voted for all the ones I know and have used, because they helped me along the way to what I know now, I’m glad there are so many distros around, many are for specific needs, to “scratch a developers itch” as they say. Just too many distro..! If Linux would want to replace iOS or M$, then we need to combine all the effort.. Exactly!The rest of distro there are … just parasites over these.Although they bring little added value, they cannot survive alone without the hosts they parasite upon. Presumably, people start these spins because the upstream distribution is not interested in the changes they want to make. Given that,it’s pretty unlikely that the upstream distro is going to welcome the same changes in the form of a so-called contribution. I think the above point is right. If you use a particular distribution and every time there is a new release you have to do certain things to get it back to the way you like it and then you suggest to the distro developers that they add in your changes but it doesn’t materialise then there is a justification for creating your own distribution. How many people do you need to use your distribution to make it a success? The answer: One. Just you. If you can justify the time and effort to spin your distribution even if it is just a re-spin and it works for you and does everything you require from it then you have justified your time and effort. You have also probably learned quite a bit along the way. One needs a vast knowledge of the Linux world to answer correctly this question. I have no idea about 80% of the distro listed above. Should I *not* save them? May be they have full of merits and actually I would be happy with one of these? I’d love to see in your list some of the FREE distros from the list that FSF post in http://www.gnu.org/distros/free-distros.html. April was certainly a month where I targeted reviews of bigger distributions such as OpenSUSE, Debian and PCLinuxOS. May will be the month for reviewing smaller distributions and I have already lined up reviews of Emmabuntus, Mozillux, SolyDXK and Linux Royal. Before I finish I’d like to comment on a few of the other comments. Firstly there is the scientific response suggesting that if I had put the items in a different order then the results would have been different. I’m guessing that if you displayed the choices randomized differently for each voter the results would differ.As is, I’ll bet that the choices listed near the top are favored. An interesting point. If you took the Distrowatch rankings and instead of ordering them by downloads you ordered them alphabetically then would people use a different spread of distributions? I think there would be certain people that would take the pin on the paper approach (The same way that I pick horses at the bookies). I think what would really happen is that people would use Google, Reddit and other distro ratings sites to find out which distributions are most popular. In truth if you go to Reddit on any given day there are people constantly asking which distribution to use. The other question that came up more than once was “Where is Linux From Scratch?” Whilst I have included this in the honourable mentions above I thought I would comment further. I don’t really see Linux From Scratch as a full distribution. It is more a guide showing how to build your own Linux system. In a similar way when I buy flat packed furniture from Argos I don’t see for example a wardrobe. I see lots of pieces of wood, screws, tacks, drawer runners and wood glue. Along with that I get instructions of how to build the actual wardrobe. I would like to thank everyone who contributed into making this poll a success. I hope you enjoyed reading this short review of the results. So what happens next…. well clearly we now need to strip it down to just 5 distributions and they are Debian, Ubuntu, Mint, Arch and Fedora. Oh well maybe we won’t then. Maybe we will just keep things the way they are. In truth the world has a happy knack of sorting itself out and the best keep on going and those that become redundant disappear into the mists of time. For those waiting for something more substantial from this blog, check back next week as I am currently running the new version of Fedora and so there will be a review for that and I am trying something out on the Raspberry PI that I need to write up. Read: If you aren't the status-quo gtfo. so basically "which distribution are you using"? I am spinning my own. Not strictly true. I've never used Debian but I voted for it because it's important. I would never use Slackware and it's not that popular any more, but I voted for it because it represents both a history and an attitude that I think are valuable. I am just curious, why would you not use Slackware? I admit it has a bigger learning curve, but that shouldnt stop a person from trying it out. Looks like there was no attempt to match the results with the question. It was "which would you save", not "vote for some to save" (although the second may be implied). 1. Whatever distro I was using. 2. Knoppix. I need my knoppix (and I suspect so does anyone else who needs to diagnose problems or otherwise fix systems). It seemed low. Given how popular Ubuntu is it's interesting that Debian is still recognised as the distro to save, and it's not a small margin. I suspect it is because most people realize Ubuntu has the same problem as all of the other secondary distros. It couldn't survive without the parent. Not even Shuttleworth's wealth could maintain the Debian packages Ubuntu uses, and without the Universe Ubuntu would be a lot less useful. You have to save the base distros if there is ever a mass extinction event. That means save Debian, Fedora, Slackware and Gentoo and as soon as the dust settles the forking will begin anew, meaning a hundred distros again in only a few years. I think the thought that it would be nice to have fewer distributions stems from the idea that if for example there was no Ubuntu than there would be more Debian developers and Mint could be an add on set of scripts in a .deb package. The problem with this opinion is ultimately you are telling someone volunteering their time what to do. Even if you are right you may end up alienating volunteers who do really amazing work at no cost to you. There are other benefits from the current mass of distributions. 1. Developing new developer talent. The major distros aren't scrappy upstarts anymore. It requires serious effort to go through the paperwork required to be a Debian developer now. And if you want to do major work on the important bits of Fedora you pretty much need an @redhat.com email address to push it through. On the other hand a small distro is unlikely to turn away anyone. Submit a patch and few patches and you often get offered commit rights. Bang, no paperwork or fuss. 2. Diversity is a strength. Most forks are eventually dead ends, but one successful one justifies a lot of failures. And there is no rule a base project can't cherry pick the good ideas back upstream if they do prove good. Except of course when the fork was a policy dispute. 3. Insurance. Yes we have no examples of a split surviving the death of the original yet but it could happen. More important is a diverse universe of distros better ensures survival even in the face of widespread madness, like the urge to package GNOME3, giving Lennart Pottering commit access. 😉 Somebody will resist; saving us the bother of migrating all the way to *BSD to keep running in a UNIX environment. >> The whole idea of "better" is entirely subjective. Better for desktops? Better for servers? Better for commercial software support? Better because I said so and I've been using Linux longer than some of you have been alive? Every distro out there was created to "better" meet the needs of someone. As the person who made this comment, I can say definitively that I did NOT interpret the question as "which is your favorite distro". I was responding to the comments, not the article and poll, because many of the comments indicated that people were voting based on their personal definition of which were better, rather than on the technical merits of the distros in the poll, so in my opinion, your poll was really, "which distros do I think are better". It is my opinion that if we were forced to keep only a small number of distros, that the obvious choice is to keep the parent distros that spawned all of the others. For example, there is no reason to save Mint, since it is just a polished Debian. The same with Korora, which is just a polished Fedora. I'm not saying that Mint and Korora are not valuable efforts, because the time and degree of expertise required to polish Debian enough to match Mint is significant and beyond the skill level of most users. I just saying that if you have the parent distro, that any of the children could be recreated if someone so desired, which is how most distros are spawned anyways. It is extremely rare for a new distro to come along that completely breaks the mold of previous distros. In the time I have been using Linux, I have seen this happen with Debian, Redhat, SLS, Arch, and a few others. Most of the others have evolved from these pioneering distros. The corner stone of all Distro's is the linux kernel. Each distro has a different selection of packages with a core lists that everyone has available. Everyone's package manager operates on the same basic principle(old files deleted new files put in place), but skinned differently. A linux based on a template system could be developed. Here's a list of apps I want. Here is all my config files. Screen the list of apps and auto solve the dependencies as much as possible. I pick the desktop manager(s) I want to include. Here's a file with all the relevant configuration changes to the desktop manager. Also here are links to all of my git and svn projects so auto-download and include those also. Dependencies could be auto-screened, for example "#include " detected so I will install the maria db and the maria-devel packages. You will obviously be compiling stuff so I will include the necessary compilers. A utility could be written to auto-detect all the changes you made to your linux desktop and upload that configuration data to the server. Click build and presto your very own personalized linux. There are really 4 kinds of Linux distro anyway IMHO. I group them by their packaging system. Any other distro outside of the 4 mentioned above is just spinoff of the four. So I vote for the all four. You are right. I am a Slackware and I agree with your selection. where does arch fit in that list? Arch is a derivative of Slackware. I might add a fifth to my original list, Puppy to represent the small linux distro like DSL. My votes were based on distros I know that provide original work on features that I think are important. Debian was first as it is by far the best base source of material (as seen in the number of debian based distros and their popularity despite being non-commercial – wow great job people!). Ubuntu for some UI contributions (and marketing approach ;-). Fedora for the Selinux (and some other) great work they do (despite not being a deb based distro). Puppy tinycore and DSL for doing the work to create very small usable distros that are a joy to use for certain nitch purposes. There were a few others in my list based on similar reasoning. I was not looking so much on what to jettison as looking at what distros provide great work that the others in the list have built on. They would be missed by anyone making their own distro. I should have given an honourable mention to Bodhi for their work on integrating e17. One of the best (and most underutilized desktops in existence). I would suggest splitting this into two: Linux for Desktop and Linux for Servers. I would have to pick depending on role. Server: RHEL, Desktop: Mint. My view is a distro is valid if it meets someone's needs not how many users it has. Some distros will cover a rather broad range of users while others are more niche distros. The diversity is a healthy sign for most situations I can find a distro that will work at least as my base. What is the perfect distro for my needs is not necessarily the perfect distro for someone else. While I personally dislike some distros and some DE's that does not mean the distro or DE is bad; it only means I did not find it suited my needs and nothing else. Also, the large number of distros allows for experimentation, especially by smaller distros in areas such as package management, alternate DE's, etc. that a more mainstream distro might not do.